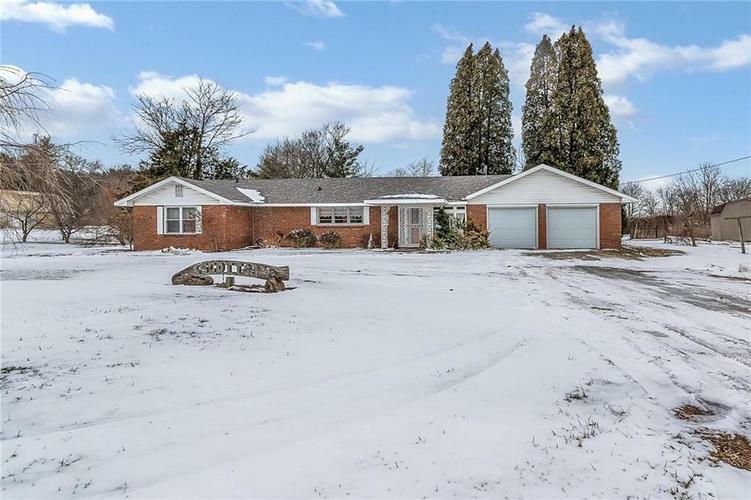 2BR/2BA brick-ranch on 4.25 acres! Step in from the covered porch. Living rm, Kitchen w/ Breakfast rm, Family rm w/ Dry Bar, cathedral ceiling w/ skylight, Sun rm w/ GL FP and access to deck in the backyard, BR's 1 & 2 and 2 full baths. New roof. 40'x30', 3-level Barn w/ electricity & horse stalls. Property has a pasture, small orchard and bridge over Lick Creek. Directions:I-69 to South on SR 13, to E on W 1050 S, to S on CR 750 W, to E on W 1100 N, to N on SR 9 (home will be on W side just N of W 1050 S).